Two antebellum houses in Starkville, the Gillespie-Jackson House and The Cedars, have recently gone on the market, according to the Commerical Dispatch, and unfortunately, the Gillespie-Jackson property is being offered as a commercial or mixed-use development, which seems to imply the owners expect the house to be demolished in the process. Gillespie-Jackson House (1850), Starkville. Photo by Luisa Porter/Dispatch Staff. Located at the now-busy intersection of Highway 12 and Louisville Street (old Highway 25), the Gillespie-Jackson House has been listed on the National Register since 1986. According to the National Register nomination, the Greek Revival style house was built in 1850. The house is a wood-frame, clapboarded “four-over-four” or “Georgian double-pile” with a side-gabled roof and interior chimneys. A monumental portico projects from the center of the five-bay west (front) facade. In the upper part of the portico is a cantelevered (and otherwise unsupported) balcony which reaches to within eight inches of the piers but does not touch them. It was built for Dr. William Gage Gillespie, “a physician who had come to Oktibbeha county early in the 1830s. By the 1850s Gillespie owned several thousand acres of land and perhaps as many as 200 slaves, and was considered to be the wealthiest man in the county (Thomas Battle Carroll, Historical Sketches of Oktibbeha County [Gulfport, Miss. : The Dixie Press, 1931] p. 93). 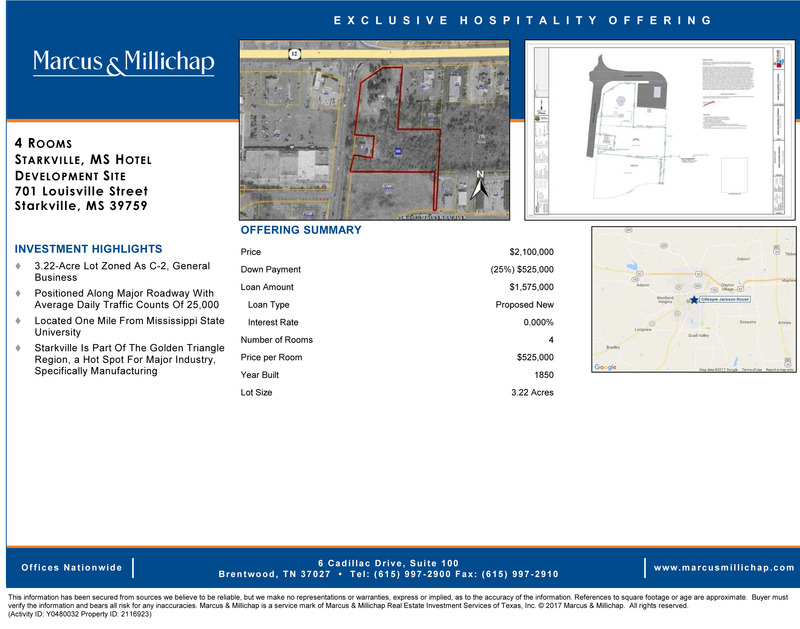 California-based Marcus and Millichap Real Estate listed the property at $2.1 million and is marketing it as hotel or commercial use, agent Wes Tiner told The Dispatch. However, he said the agency would entertain offers for residential use. Tiner added the property is priced to move, and he expects to sell it sooner than later. Anybody out there have ties to Starkville and a load of money you would like to use to save this important local landmark for posterity? a two-story vernacular Greek Revival house, with a brick lower story and a wood-frame upper story, that has three tetrastyle porticoes. . . . The Cedars is significant as the home of the Montgomery family and as one of the few remaining antebellum structures in Oktibbeha County. Starkville had only a few wealthy planters and therefore equally few large planter homes. The Cedars is decidedly the grandest of these few and is particularly notable for having its second floor as the main floor. This so-called raised cottage type evolved on the Gulf Coast from French and Spanish 18th-century prototypes as a means to have living spaces elevated for ventilation and to avoid flooding. It was enlarged and given Neo-Classical dress in order to make it an appropriate 19th-century dwelling for Southern planters. The Cedars is the only remaining raised cottage type plantation house in Oktibbeha County. The thought of such a house being discarded for something like a Zaxxby’s or a Microtel makes me physically ill. Does registered status not protect these properties at all? I thought that was one of the reasons for such designations! No, that is a common misconception. National Register status only provides limited economic incentives for preserving historic properties. It provides no protection from demolition or inappropriate alterations for historic properties. Afterall, people do not want the Federal “Gubment” interfering with private property (unless it is to take someone else’s property away from them so a well-connected corporation can build an oil pipeline). The only statutes that protect properties from demolition are local preservation ordinances and only if they are well-supported and enforced by local governments and have the expressed power to prevent demolitions (some only delay demolitions). There is also the excellent state Mississippi Landmark designation, one of the very few statewide preservation laws, but it is very rarely used on private property, mostly government-owned buildings (schools, courthouses, etc. ), and can be circumvented by poorly, ill-informed decisions by the MDAH Board. This is only partly true. The NR listing will help to protect the structure from development or other projects that are either state or federal in nature and possibly even local government sponsored (i.e. funded or permitted). If an NR structure is within an area that is likely to be impacted by such a project then the agencies undertaking the project are required to attempt to avoid, minimize or mitigate the effects of the development (i.e. relocated, or save part of the structure or complete a full documentation and salvage of the structure). Private development that utilizes federal, state or local incentives or funds may also be required to preserve the structure in a similar manner despite the fact that they are private entities – for example, this would be the case if the developer is using tax credits or is transferring development rights to fund a project. I will agree with you that my previous statement was a simplification of the National Register’s demolition protection. If federal funds are used for a project, than there is possibly limited protection from demolition. But, even if federal funds are used, there is no guarantee that a historic building is protected, just that the loss of the historic building is mitigated. That can be through the activities that you mentioned which may include saving the building. I know it has happened before, but I have never seen either architectural salvage efforts or building relocation as part of any federally funded project. Documentation and funds allocated for historic preservation activities seem to be the usual mitigation practice. I have also only seen a few occasions where National Register status prevented demolition. Those all involved local governments using federal funds for “blight elimination.” Two of those occasions I was personally involved in, and the demolition was denied less because the State Historic Preservation Officer was interested in saving Victorian houses and Craftsman bungalows and more because there was no mitigation plan at all for the loss of the National Register listed properties – i.e., there was no money allocated for “historic preservation activities” in this historic buildings demolition activity. If it is a privately funded project, there is no demolition protection. If it is a local government funded project, there is no demolition protection. If it is a state government funded project, there is no demolition protection. With those last two, unless the local or state government in question has passed their own law regarding the protection of National Register listed properties, then they have no protection. Saving the Gillespie-Jackson House will be a big test, possibly the biggest they will ever face, for Starkville’s historic preservationists. Will the Starkville Historic Preservation Commission attempt to designate the Gillespie-Jackson House a local landmark and prevent its demolition? Would the City Council uphold that historic designation? Doubtful, perhaps on both counts but especially the latter, since I doubt there is a city councilman/woman serving anywhere (not just Starkville) that would not throw his/her mother under a bus if doing so would mean more development and “progress.” It is an enormous challenge, but if Starkville’s historic preservationists cannot prevent the demolition of one of the only two antebellum houses in the town and the closest one to downtown (I believe The Cedars is slightly farther out and is certainly less prominent as far as location), then they should probably throw in the towel and call it a day. In terms of architectural and historical significance, Starkville does not have half-a-dozen buildings in the city of equal stature to the Gillespie-Jackson House. Let’s face it, what sort of rich idiot would pay $2.1 million to live in a house at the corner of a very busy five-lane highway and three-lane arterial road. The only way it would be a commercially successful proposition would be to develop the land on Louisville Street south of the house, which could only have housing since it has no street frontage left. Just another eleventh hour effort brought to you by the historic preservation community/movement that lacks the resources and support to proactively protect anything until bulldozers are lining up for the kill. I agree this will be a huge test and a great blow if the house is lost, but I don’t agree that if they lose, the HPC should just throw in the towel. Remember that Starkville hasn’t had a preservation commission for long–what, maybe 5-6 years? If this was a long-established commission, as in Natchez or Jackson, they would have had more of a chance to build their landmark list and would therefore hold more responsibility for not proactively designating the Gillespie-Jackson house. But that commission has been actively working to build their list, with a locally designated district on Greensboro Street and working toward one or two others. That’s way more than many communities have done in such a short time (some long-established HPCs have never designated anything). The Gillespie-Jackson house was built by William Cage Gillespie, not “Gage”. There is a small cemetery on the property. It’s interesting that these two antebellum houses that anchor the town are connected by the families that lived in them. Julia Gillespie, daughter of William Cage, was the first wife of William Bell Montgomery, who built the Cedars. William Bell Montgomery is important for bringing the dairy industry to Starkville. Montgomery Hall on campus is named for him. The Eshees did the Starkville community a very important service when they purchased the house after Joe Pressley Montgomery’s untimely death. It has been very hard to see the loss of historic structures in Starkville over the years, and it is even harder to think that these two homes that are so connected to Starkville’s early history might not survive.